There’s a proposed renovation for the athletic fields near the Beach Chalet. 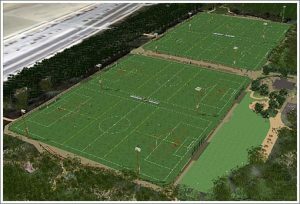 The current grass athletic fields would be renovated to be renovated into four synthetic soccer fields with lighting for night play. The renovation will include updated restrooms, a parking area, picnic tables, bbq pits and spectator stands. The deal is not yet a done deal. There is another public hearing before the upcoming Environmental Impact Report and some neighbors are not onboard with the plan-fearing traffic, noise, and unwelcomed lights during night-time play on the fields.